The Bulls Tuesday, shorthanded but big of heart, defeated the Washington Wizards 97-92. 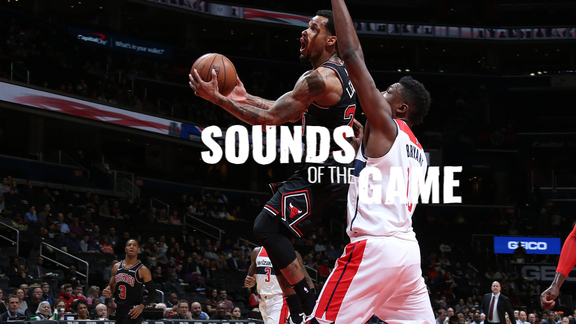 The Bulls got big hustle plays down the stretch with a loose ball from Nikola Mirotic and an offensive rebound from Pau Gasol to hold off the charging Wizards, who lost for the 12th time in their last 15. The Bulls were led by Mirotic off the bench with 23 points and eight rebounds and Aaron Brooks with 22 points and a season high eight assists. Gasol added 20 points and 10 rebounds and Joakim Noah hustled his way to 14 points and 12 rebounds in a game marred late by cheap shots and a flagrant foul on Nene against Noah. John Wall had 21 points and 11 assists for Washington. The Bulls tied the season series with Washington at 2-2 and went to 38-23 on the season. The Wizards fell to 34-27. Coach Tom Thibodeau dug deep into the bench and got a nice defensive effort to start. The Bulls took a quick 9-2 lead and led 24-22 after one quarter with Gasol’s 10 points. 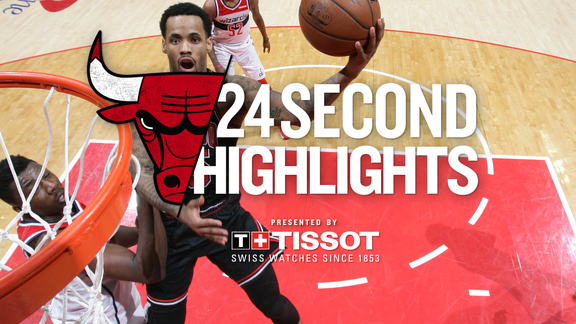 The Bulls then got a strong run of nine straight points from Aaron Brooks and eight points in the second quarter from Nikola Mirotic, highlighted by a Gasol block on Bradley Beal and full court Mike Dunleavy pass for a Mirotic dunk with that seven-point halftime lead. The teams exchanged baskets over a wild five-minute stretch in the third quarter. But with Brooks and Gasol matching shot for shot, the Bulls went into the fourth quarter with a 74-67 lead. 1. Nikola Mirotic has attacked the NBA game with confidence and has even emerged as a go to guy for the Bulls with their decimated roster in leading the Bulls in scoring for the second straight game. 2. Aaron Brooks needs to be Aaron Brooks, which means less a floor leader than a scorer. Brooks has been caught in between starting but returned to being aggressive and got the Bulls a halftime lead with a big second quarter. 3. Doug McDermott and E’Twaun Moore got regular rotation time with the injuries; they didn’t shoot much, but both played aggressively, especially on defense and both were in the game in the first half when the Bulls increased the lead.